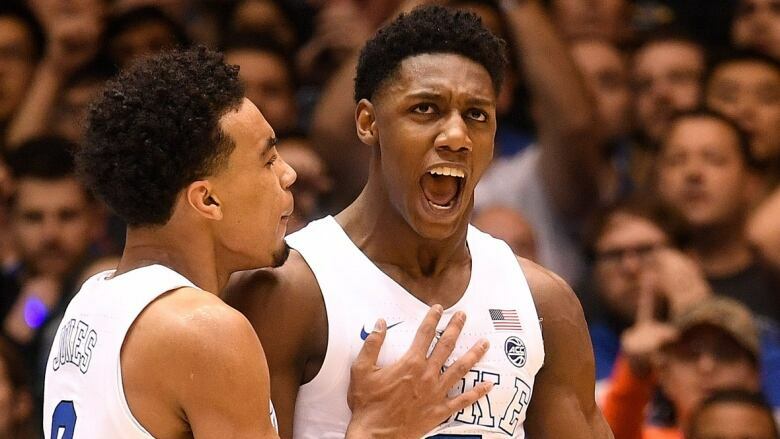 Canadian basketball star R.J. Barrett, who leads the Atlantic Coast Conference in scoring, has been named the national player of the year by USA Today. The 18-year-old from Mississauga, Ont., leads the Atlantic Coast Conference in scoring with an average of 22.9 points a game, and helped the Duke Blue Devils to the No. 1 overall seed in the NCAA tournament. Barrett set both the Duke and ACC freshman scoring records with his 799 points. Against top 10-ranked teams this season, Barrett's scoring average of 25.5 leads the NCAA. Barrett is the only major conference player to score more than 13 points in every game this season. He's also seventh in the conference in assists (4.12), 10th in rebounding (7.5), and 10th in field goal percentage (45.7). Barrett was also a USA Today all-American selection, adding to the all-American honours from USBWA and Sporting News. Barrett and teammate Zion Williamson are both finalists for the Oscar Robertson national player of the year Award, Wayman Tisdale freshman of the year and the John R. Wooden player of the year award. The Blue Devils open March Madness on Friday in Columbia, S.C., against North Carolina Central or North Dakota State.